Fragrance isn’t a mere accessory in a man’s wardrobe; it’s his signature. 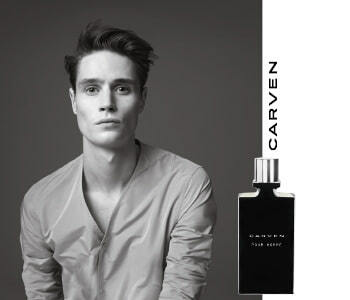 It is with this spirit of adventure that Carven Pour Homme was born, the very essence of Carven style. His is an off-beat spirit, seemingly classic with a touch of bad boy charm. His cultivated and urban fragrance is a perfect match for his natural charisma, ensuring that the ordinary becomes extraordinary. The racy and elegant essence is a melange of woody, spicy and aromatic notes, with a burst of modernity that carries it through the ages.